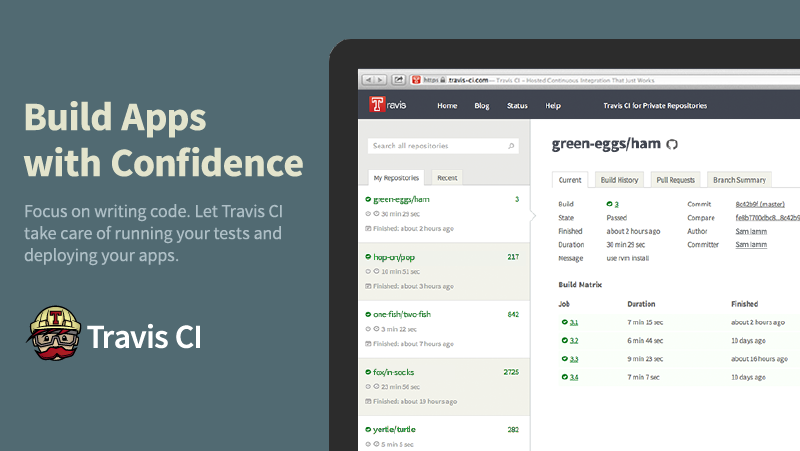 We are pleased to announce our latest partner, Travis CI! [partner url=“https://travis-ci.com/”]Travis CI[/partner] loves The Changelog and they want to give our members 20% off of any plan for 12 months (an entire year) – saving you $309 to $1,173.60 over the course of a year depending on your plan. Travis CI lets you focus on writing code by taking take care of running your tests and deploying your applications for you. They’re a hosted continuous integration and deployment service for open source and private projects – tightly integrated with GitHub and offer first class support for many languages. Getting started with Travis CI is a simple process. Enable your project, add some basic build instructions, and commit your code. After a successful build, Travis CI will deploy your app to your production environment with support for your own servers, or cloud services such as Heroku, Engine Yard Cloud, Nodejitsu, and many others.